﻿ [Kodo Online Store in English][Photo Book] "Kasane no Kiyohime Monogatari –The Myriad Layers of Kiyohime–"
All Items > Books > [Photo Book] "Kasane no Kiyohime Monogatari –The Myriad Layers of Kiyohime–"
[Photo Book] "Kasane no Kiyohime Monogatari –The Myriad Layers of Kiyohime–"
Item Name [Photo Book] "Kasane no Kiyohime Monogatari –The Myriad Layers of Kiyohime–"
Chieko Kojima has based her life’s work on the story of Anchin and Kiyohime from the Dojoji Tales. 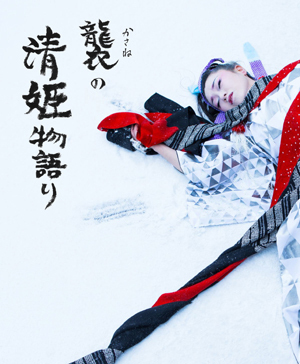 Over the course of a year, she let her own unique Kiyohime explore the four seasons on Sado Island to create a brand new tale in collaboration with photographer Maiko Miyagawa. This stunning collection is now available as a photo book.